It’s the first Sunday of August (whoa, it feels like just yesterday I said that for January 2011), so it’s time to shine the spotlight on a student or new-to-the-field illustrator. And I’m doing the latter today — not a student, but an artist whose first illustrated picture book was just released this year (the only picture book this year, I can safely say, in which a sheep is slaughtered, grilled, and made into shish kebab). 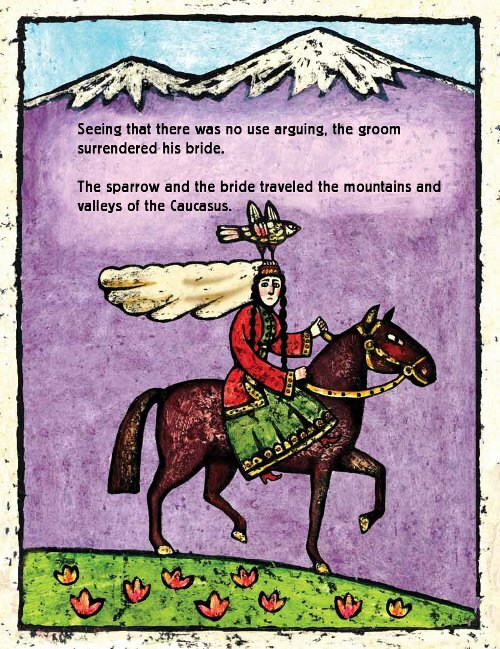 Maria Zaikina rendered the art in Lucine Kasbarian’s The Greedy Sparrow: An Armenian Tale, released by Marshall Cavendish in April, with layers of wax and oil paint and then cut away the layers to reveal the colors underneath. (Is this a sort of scratchboarding, perhaps?) I’m a nerd who, yes, reads reviews for fun, and I like how Kirkus described the illustrations as having, as you can see above, “an appealing, vigorous heft.” Yeah. What they said. But, first. Quickly. It just occurred to me that it’s the five-year anniversary of 7-Imp. I’d almost forgotten. Back last month, when I realized a birthday was coming up, I figured I should do something special for the big five-year one. But then I got busy, and now I’m at a loss anyway. I’d really rather just do what I always do — feature some art. But I want to say, quickly: One of the reasons I started this blog five years ago—co-founded it, remember, with my best friend, who is still my best friend but just no longer a blogger (here’s the low-down)—was to connect with others and to keep my foot in the door of children’s lit. I was suddenly at home (my choice) with young babies, who were puddin’ heads (though screamy ones) and kept me on my toes, but altogether incapable of expounding on the latest and greatest in children’s lit with me. (All I was gettin’ was some goo-gah here and some baa-baa there.) I was no longer in a school library, where I could gab daily with teachers and other librarians who loved children’s and YA lit as much as I did. And I really missed that. So, feeling isolated (while also joining forces with my long-distance best friend, with whom I LOVED discussing books), I reached out via my laptop to sort of create my own colleagues, if you will, through this blog. Eisha and I found the other children’s lit bloggers, and we jumped into the discussion. And I am forever grateful for what it has brought to my life. I always say—and I mean it—I wouldn’t know how to count blogger stats if you put a gun to my head. I honestly don’t care. I just want to connect. If one person is reading, I’ll keep doing it. And so thank you to all you One Persons out there stopping by to read and see and chat and let me be a part of the discussion. And to all my blogging friends, whom I truly admire. AND to all the authors and illustrators and etc. who stop by here to visit the 7-Imp cyber-salon over coffee and keep things interesting and beautiful with their words and their art. I’m done. Now, back to Maria’s arresting art. 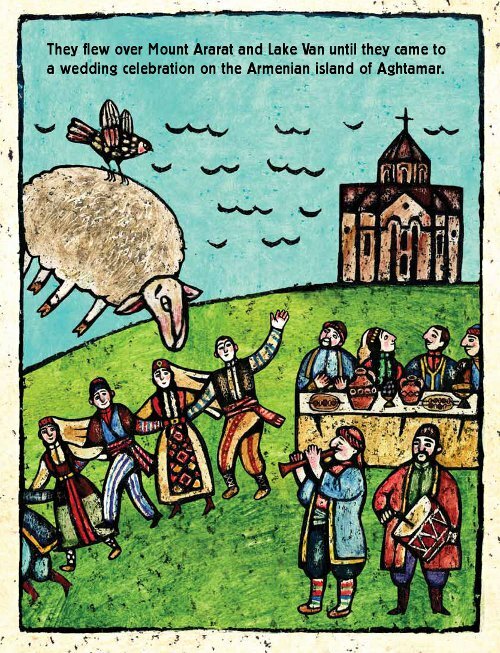 Armenian fables begin with “Once there was and was not” to suggest that fantastical tales may be real or imagined. 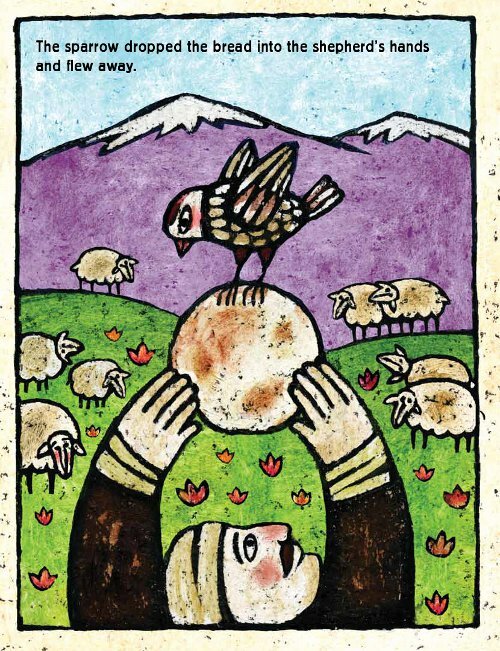 The fable of the sparrow, which has been in the Armenian oral tradition for centuries, was first put to paper by the Armenian poet, Hovhannes Toumanian (1869-1923). In The Greedy Sparrow, an original composition, we learn that people who engage in dishonest or selfish behavior may end up losing whatever they gained because of that behavior. Did you all know this about Armenian tales — the “once there was and was not” bit? I did not. I love that. 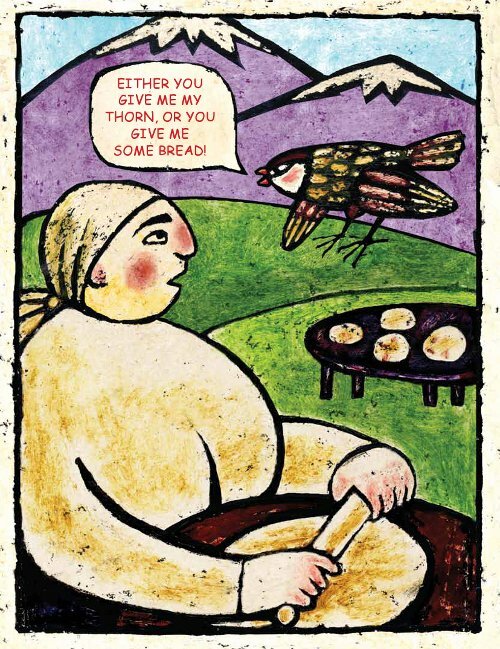 Back to that thorn: The sparrow gets a thorn in his foot and then proceeds to trade the thorn (with a little bit of bullying and a lot of greed) for some bread, trade the bread for some sheep, trade the bread for a new bride, and so on. In other words, to each act of kindness paid him, he responds with an attempt to trick his way into even more generosity. 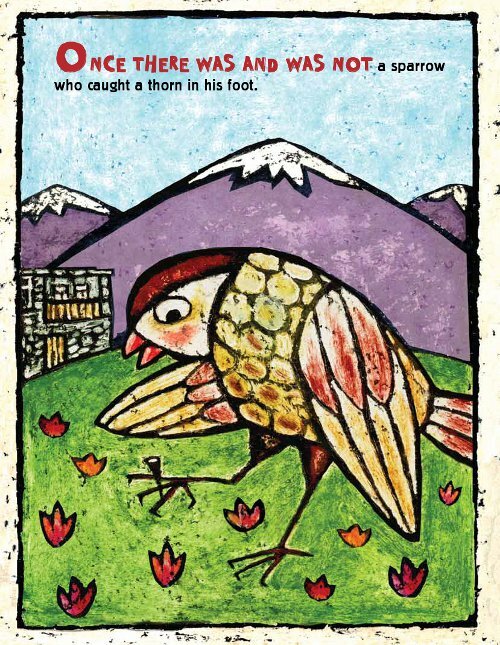 “A homely sparrow turns a thorn in his foot to fine advantage in this simple spin on the familiar folktale of the rising fortunes and eventual downfall of one who overreaches,” writes School Library Journal. Yup, don’t want to give away the whole tale here for those who might want to read it, but he definitely overreaches and, at the book’s close, ends up as he started. Kasbarian—a writer, illustrator, and descendant of survivors of the 1915 Turkish genocide of the Armenians, Assyrians, and Greeks—tells the story with economy and no fuss whatsoever, occasionally using speech balloons. She learned to recite this fable from her father, whose own grandmother was a storyteller and taught him this fable of the sparrow and other Armenian fables in her dialect. Zaikina is from Moscow and her heavily-outlined, brightly-colored neo-folk illustrations are textured and filled with humor. I’ll let her artwork speak for itself. Enjoy. 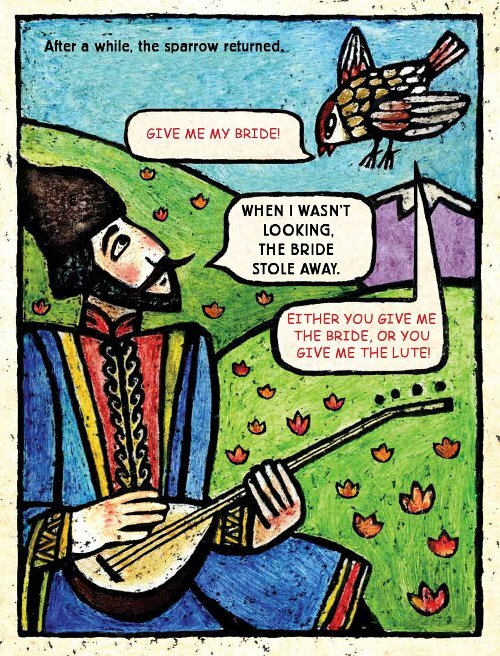 THE GREEDY SPARROW: AN ARMENIAN TALE. Copyright © 2011 by Lucine Kasbarian. Illustration © 2011 by Maria Zaikina. Published by Marshall Cavendish, Tarrytown, New York. Spreads reproduced by permission of the author and publisher. 1) I thoroughly enjoyed jurying for the Society of Illustrators’ Original Art award this week. It’s really and truly an illustrators’ award, illustrators judging their peers (with just a couple of exceptions, including me), and it was fascinating to be a part of it. And everyone was super nice. The Society said they’d announce the Gold and Silver winners we chose by end of week. Still no announcement up at the site yet, but I’m sure it will be soon. 3) While in NYC, I got to meet and hold the beautiful baby of one of my co-authors. 4) Did you all see this? Check out the one for The Wizard of Oz. Heh. Thanks to Betsy Bird for the link. Okay, I’m done now. I guess the kick is that, knowing they’ll both be in school and summer is ending, we’ve been doing things like having chocolate chip pancakes for dinner and staying up extra late. Those of you in the Northeast might be interested in this Ezra Jack Keats’ exhibit. Boy, do I wish I could go. On November 5, with Jon Scieszka, I’m co-hosting the “90-Second Newbery Film Festival” at the New York Public Library main branch, screening the best entries. On November 16, I’m hosting the same film festival at the Harold Washington Library in downtown Chicago. The film festival won’t be just movies. There will also be short Newbery-book-themed live performances in between the movies. A kind of cabaret atmosphere! The deadline for movies is October 17, 2011, but James says they’ve already received “some jaw-dropping entries.” You can see them at this page of his site. Enjoy. Here I am! Head of the class, although there’s probably someone writing kicks at the same time. Happy 5th blog birthday, Jules! What kind of cake shall I make? 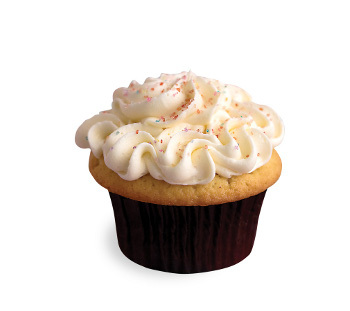 You can have any flavor, as long as it’s butterscotch (because that happens to be the cake I’m making tonight). I enjoyed the children’s book posters– I paused for a few seconds with the Alice poster before the *aha* moment arrived. 1. Spring roll wraps are new to my household, and they are a great new (for us) way to get veggies into a meal. 2. I got running gear today. Now I LOOK like a poseur in addition to feeling like one. Seriously, though, there’s something to be said for the power of wicking fabric. Who likes to be clammy? Not I. 3. I got to hang out with a friend I’d not seen since June. 4. My husband and I decided it was time to break out the last of the home-made limoncello, seeing as that we have plans to visit the friends who made the limoncello in the first place. 5. Homemade cherry popsicles, courtesy of Gluten Free on a Shoestring. Though my daughter is off of her trial gf diet, I still make things from that website. 6. Did I mention that spring rolls come with dipping sauce? 7. Scott Westerfeld. I’m finally getting around to reading his books, and how I enjoy them. Happy Birthday Seven Impossible Things Before Breakfast!! Happy Birthday to yoooouuuuuuu……. I haven’t commented in a while but I always stop to read your wonderful posts. I especially love Maria’s artwork! I’m all for scratchy heavy black lines. What an interesting technique. 1. My dog finally learned to swim. 3. NEXT year I’m going to LA SCBWI. I hope everyone’s having a great time. 5. Next weekend my husband & I are going to drive over the mountains through Rocky Mountain National Park. Very happiest of birthday to 7-Imp! Coming to this space is always enriching and enlightening. I know I can be sure of getting a good dose of beauty when I drop by, and that’s always a good thing! 1. We finally got an allotment! Weeds are waist high, but the place is full of potential! 2. Random House has been v generous in sending me bit and pieces to help my kids’ school celebrate Children’s Book Week in October. 3. Very excited to find out that Arrietty (studio ghilbli’s Borrowers) is on in my town this coming week – will be going tomorrow hopefully! 4. Have successfully (ie happily) survived first proper week of our school hols. Done lots of fun things and not felt too frazzled! 5. Have really enjoyed my Sunday morning treat of marmalade on toast – only once a week but worth waiting for! 6. Discovered Hedy West! Can’t believe I didn’t know her music before. Happy Blogoversary! Your children are so gorgeous, and even though you feel self-indulgent about mentioning them, I love to hear about them, they are beautiful. I’m so envious of you meeting Wee Oiseau!! Hooray for 7-Imp! Happy Happy Blog Birthday!! Maria’s art is gorgeous — and I love the pics of you and the soon-to-be-kindergartener ?! Ack. Seems she was three only yesterday. Very cool that you saw that play designed by Mr. Prather and got to meet Baby Bird :). My Dad (age 96) is finally feeling better. He broke a vertebrae in his back and had been in excruciating pain for weeks. Had surgery Friday and is on the mend. Finally finally moved alphabet soup to WordPress. I’m *still* archiving, tagging, tweaking, driving myself crazy because I hate technical stuff. Now I need a vacation from my July vacation which really wasn’t a vacation. . .
We have two spotted fawns roaming about and continue to enjoy seeing Fuzzy and family coming for supper every night. Having friends over for a late-ish lunch today. Will be nice to catch up on their news. Happy birthday! And congratulations on your lovely blogging goals, Jules. The Greedy Sparrow: just lovely. My kicks are focused on Thursday, when special collection librarians are prepping small stacks of old journals, letters, and even artwork for me to swoon over. I mean study. I’m planning a break for lunch with a friend, and when the library closes, may get in a pond swim if the weather’s right. I’m always shocked when someone tells me they don’t like research. Happy blogiversary! It’s been so amazing to stop by and chat and to come by check out all the great art on display! And don’t fret about missing a plan for your 5th birthday, your 7th one will be the one to make a big shindig out of! “Once there was and was not” is awesome. I have read The Greedy Sparrow too and should blog about it soon. HAPPY BIRTHDAY, SEVEN IMP. YOU HAVE NO IDEA HOW IMPORTANT YOU ARE TO ME. SERIOUSLY. YOU ARE MY BLOG CRUSH AND AN INSPIRATION AND INFLUENCE ON MY OWN BLOGS. 1. JP and the rest of the team returned from the World Championships in Russia with three bronze medals and one silver medal. They leave for Korea tomorrow for yet another taekwondo competition! 2. Time with my daddy. Time with my cousins Bobby and Lu. Time with family and friends. 6. Scumble by Ingrid Law. 7. I had my hair dyed “extra dark red blonde”!!! Happy FIFTH anniversary! You do realize that this makes you, well, venerable, don’t you? Next you’ll be telling us you’ve been invited to judge— Oh, wait. Never mind. I’d never heard of that “Once there was and was not” tradition, but I think I sort of love it in an OMG-I-wish-I’d-made-that-up way. And the artwork? It’s almost like aged stained glass, with light behind it. So beautiful. Do you have any idea what the original medium was? So happy for your NYC experience! That bar alone, you’d have had to crowbar me away from. Glad you met up with Mr. P; I found a YouTube video of excerpts from the play, which give a good idea of the quality of his work on the design. And I almost used a Jack Handey Deep Thought in a blog post this week: “When he was a little boy, he had always wanted to be an acrobat. It looked like so much fun, spinning through the air, flipping, landing on other people’s shoulders. Little did he know that when he finally did become an acrobat, it would seem so boring. Years later, after he finally quit, he found out he hadn’t been working as an acrobat after all. He had just been a street weirdo.” Ha! 1. Taking a break from the daily early-morning routine of the last 3 years. 3. Opportunity to learn and play with some technology at work (those “QR code” thingies). 4. Designing a scavenger hunt using QR codes. Heh. 5. Confirming an upcoming sibling visit here. 7. Deep, limb- and neck-stretching, really satisfying yawns. Thank you, Jules & eisha, for sharing your love of literature and illustration with us, and for giving us a place to rejoice on a weekly basis. Seven Imp puts art and heart into our lives. Farida: Welcome to Westerfeld. Let me know what you’ve read/what you’re reading, and what you think! Jill: Welcome back/out from the lurking shadows! Please hello to your dog for me. I hope that you and your husband have a fun and safe trip! Zoe: Three cheers for potential, and for all of the cheerful exclamation points in your kicks! Sounds like you had a great week AND that you have a great time ahead of you. Pragmatic Mom: Thank you for your generosity. Thank you for making donations. Hola to your dog. I wish I could nap. Lots of healthy, healing vibes to Jama’s dad! Jama, I hope that your blog migration goes smoothly. Please coo at the critters for me. Jeannine: How wonderful, to have a task that makes you swoon! Have fun. Are there ducks in the pond? Tarie: Is “extra dark red blonde” nearer to auburn or strawberry blonde? Enjoy your time with your family. Congrats to the team on their recent rankings, and good luck to them at their next competition! 1) Last Sunday, I had a blast on the set of a comedic short film about the zombie apocalypse. The crew and cast were so much fun. The day went so well. My costume was perfect. All good things. I can’t wait to see the final cut! 2) On Monday, I was offered the role in the musical staged reading I’d auditioned for two days prior. My fingers remain crossed as I wait to find out if the rehearsal schedule will mesh with my current schedule. 3) Rehearsals for my current play. 7) I performed last night. It was an honor to have my piece selected. It was a wonderful opportunity. The piece is important to me, both personally and professionally, and that was the first time I’d ever shared it. LW: Auburn! Oh my gosh, I have auburn hair. Hahaha. HAPPY BIRTHDAY, 7-IMP! Sorry to shout, but this is an occasion to celebrate loudly — such a happy, welcoming place to be! Thanks for giving us a great community of art, literature, and good people, Jules! And I can’t wait to hear about your awesome trip to NYC. 1) The creativity-freeing concept of imperfection, which allowed me to finish an art project that had been sitting around, waiting on me to chuck out the rule book. 3) Celebrating Lucille Ball’s 100th B-day yesterday by watching some hilarious episodes of “I Love Lucy”. Lucy was a comic genius, and I’m grateful that she was in the world. 5) Sleeping in (this morning! Very rare for me). 6) My neighbor’s two cats have started taking naps in my backyard, and it makes me happy to see them out there every day, like borrowed pets. Happy blog birthday, thankyou for being there. Thanks for the kind words Jules…I mean about the play, not about me…glad you had a good time in the city! Slacker? Hmph. Check your frickin’ email! Farida, thanks, and I’ll take any cake involving peanut butter and chocolate. … I don’t even know what wicking fabric is, but I like the sound of the running gear. I purchased actual work-out clothes, and my five-year-old laughs at me, never good for one’s self-esteem. Hmmm. Spring rolls. We need ways to get veggies in our diet, too. Jill, Between the Pages looks interesting. Thanks for the linkage, and I’ll try to explore later when this manuscript is turned in. (Any time now. Tick tock.) Have fun next weekend! Zoe: A “good dose of beauty” sounds good. Glad I can facilitate that. Oh and THAT’S RIGHT YOU GET TO MEET MINI GREY OH MY GOD THAT IS SUPER COOL. Please, will you tell her I said hi, if she recognizes me/the blog? … And thanks for the music tip. Always like hearing new folks. Tanita: SHUCKS. Thank you. And Lily? She was a puddin’ head extraordinaire. Well, hello, Pragmatic Mom. That description of Maria’s process is straight from the copyright page. I don’t have more info but wish I did. The author also tells me there are TWO Maria Zaikinas —both from Russia—and it’s the other one who was the brand identity designer (or whatever it was called), so I deleted that AND deleted the link to Maria’s site, as I may have had the wrong one! Whew. Hope to find out soon which site is hers, and then I’ll re-link. … I seriously need to purge our house, too, of old toys and such. I keep putting it off. Congrats on getting that done. Jama, so good to hear your father is feeling better. Such great news! Continued good luck with WordPress. It’ll be worth it in the end. … Hope you enjoyed that lunch today. Jeannine, ooh, that *does* sound like fun. Who wouldn’t agree? JJK, thanks! You’re right about the 7th. Hadn’t thought of that. Tarie, thank you. That’s very kind…Congrats to JP and the gang! You’re right about tucking in. Exactly right. Which is one thing I told her. John, nope, don’t know details behind the artwork, but it sounds like more folks than just me are interested, so perhaps I can track down the artist? And I nodded when you typed the wish-I’d-thought-of-that thing, ’cause, right, I do too! It’s fascinating. … Excellent that you found that video. Neat story he told me: You’ll see at the foot of the psychotherapy chair (is there a name for that?) a lion. Now, the whole premise for the play is based on the fact that Freud’s journals (in real life) say something about having been visited by “an Oxford don,” I think it was, so the playwright imagines, what if it had been C.S. Lewis and the play was born. So, this visit happened before the Narnia chronicles were written, so Brian placed a lion there at the couch, as if perhaps that had given Lewis an idea…Brian says the actor caught this, too—an aha! moment—during a rehearsal and thanked him, and I guess that type of thing makes scenic designers super nerdy-happy. …. Oh, and thanks for Gulp. Gonna wait and watch when I can see it with my girls. Little Willow, “art and heart.” I like that, too. Thanks. Wouldn’t be the same without you. … I love kick #7, as well as zombie apocalypses. Congrats on the new role! Hope the schedule works out. Fingers crossed here in Tennessee, too. Jill, thanks! I mean, THANKS! I’m all for shouting, I am. Thanks for kick #2 also….must explore. I had to get a new iPhone case, and it makes it feel like an all-new phone, even if I dislike the color. Pet those cats for me, Jill. I may be taking the cat-crazed daughters to meet some just-born baby kittens, and they may deafen them with their shouts of “ADORA-CUTE!”, which is what they do, you see, when cats are around. They are seriously insane for cats. 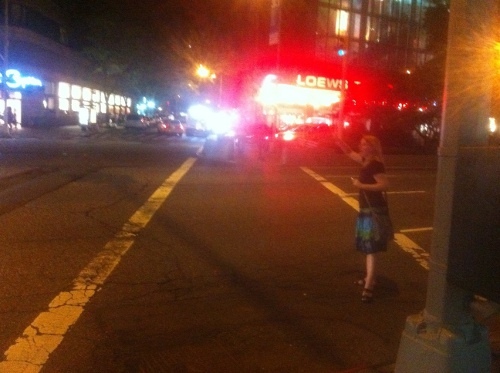 I was being dramatic, knowing this was on film, but one DOES have to hail a cab in NYC—and at night—with much confidence. Was it Denise who once said we have so many “J”s here on Sundays? Jill, Jarrett, John, Jill again, Jules, Jama, Jeannine…there are many of us today. Happy anniversary to the best illustration blog on the internets! WOO-HOOOOOO!!!!! Happy Blogiversary, Jules! I can’t believe it was 5 years ago. But then, I can’t believe we’ve been friends for almost 20 years, either. Frankly my jury is permanently out on anything that makes how old I am seem kinda real. I’m so pleased and proud of everything you’ve done with 7-Imp. You’re a juggernaut. And a Spartan. Tarie, I need to see a picture of that hair. Found this gorgeous animation by illustrator Maria Zaikina on YouTube and just had to share!!! Eisha, 7-Imp ain’t nothin’ without you, yo. Tarie, I SECOND THE PICTURE REQUEST. 2) Lindt’s Touch of Sea Salt dark chocolate (which I’ll happily share with you if you happen to be in Vermont this week… if not, please enjoy a virtual nibble or several). Erica, thanks! And you’re making me drool with sea salt dark chocolate. Especially Lindt’s brand. Congrats Jules (and Eisha too!) for creating such an awesome place full of incredible images and interviews. I don’t have kids, but truly love that all my friends with kids turn to me for book advice and recommendations, Cuz I get pretty much almost all of my information right here at 7 Imp! And Sundays, well, my Sundays are never complete without at least stopping by to read everyone else’s kicks. 1) Baked blackberry banana muffins tonight. The whole house smells awesome. 2) Brunch today with a good friend at a French bakery. Great food and great to catch up. 3) Drinks with another friend and meeting her husband for the first time last night while listening to her mom’s band play. Very fun! And for a good cause, since they were fundraising for a marathon they are running this fall. 4) Getting a completely unexpected compliment from someone I had just met. I don’t know why it is, but somehow compliments from other women seem to have more impact on me, in a good way. 5) Read Dreamland Social Club this weekend and really enjoyed it. 6) Witty exchanges. So. Damn. Fun. I’m in between school semesters and catching up on my blog reading–and my oldest is heading to kindergarten in a week. sniff sniff. Baked blackberry banana muffins. I’ll be over soon. Hi, Betsy! Glad you’re enjoying the picture books. Best of luck with the kindergartner’s first day. August 6th is the “birth day” of my first grandchild! Julia Anna Murphy was born at 1:22 am on Saturday–and I was there for the most memorable experience of my life. I am floating on cloud nine at the moment. Julia will be coming home today. I’ll be there to help out…to bring dinner…to hold my little Julia. Hello Jules, this is such a sweet post, love it. You have a great blog also. Do you do link exchanges? let me know if you do, to show you my sites. Elaine, congrats! She is so beautiful. Hi Cathy. What are link exchanges? Not sure what you mean. Happy Anniversary and Happy Birthday! What a lot of happies 🙂 We’re on vacation so I’m going to be short cause I promised myself a break from the screen but just had to take a minute or two to visit my favorites! And how funny- my oldest will be in 3rd grade this year and my youngest in Kindergarten so I’m right there with you- metaphorically though cause we only have 1/2 day kindergarten! Anyway… enjoy all your celebrations! Thanks, Stacey. Good luck to you, too, with the start of school! Congratulations on your anniversary, Jules! It is such a lovely place to visit. Make time to celebrate! Thank you, Jules and Terry, for sharing Maria Zaikina’s rocking animation of an Armenian lullaby! Wow = she captured so much emotion. Happy birthday Jules! I LOVE those posters, and the artwork and animation by Maria Zaikina… beautiful! Just wanted to send my congraluations/happy birthday wishes as well! I only have a few blogs that I have stuck with for longer than a month or two – and this is one of them. Every few days I am so inspired and educated by amazing art (and words), so I thank you for your commitment to sharing talent and finds from around the world. 2. I have a studio! woohoo. And I’ve been filling it with art bits, plants and music. 4. Winter is breaking in Melbourne – I planted bulbs, and the first have started to flower. This make me extraordinarily happy. 7. My family are coming over from the other side of the country this week. I miss them. Thanks, Jess. I must go find your cover when my week slows down. Congrats on the studio, and have fun with your family!